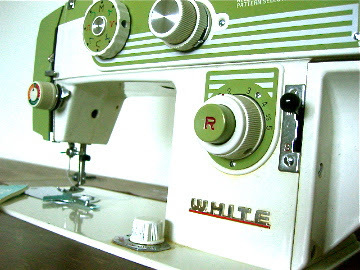 In 1975, the Toyota company (yeah as in the car company) manufactured my White sewing machine. This is the machine I learned to sew on and it is still awesome. I also drive a Subaru. The Japanese sure know their cars and apparently sewing machines. When I was 11 I took a sewing class. If I recall correctly, I made a tote bag with an amazingly awesome coyote iron-on design on the front, a sundress that ended up being used as an apron and my final piece was a Blossom-esque romper with a Paris, France motif. I remember wearing the last number on a daddy-daughter date with a sweet, white baseball cap (worn side-ways of course). If memory serves, it looked a lot like this but longer and with buttons down the front. Anyway, after my minor fling with this sewing machine in my pre-teen years, I hardly touched it again until I was married. Over the last 12 years, I've only broken it out to sew a skirt or two, and maybe a few burp cloths, blankets or lovies to give as gifts. This year I decided that I was going to actually use my sewing machine. My New Year's resolution: Sew Something. It's a bit vague, but don't worry, I have a few projects in mind. Here's a sneak peek at my first sewing project of the year. Here's a hint: I just purchased a Kindle. :) I'll have updates on that later. This is one of my resolutions too! I actually spent the majority of this evening searching for fabric and good sewing books. The last time I took a sewing class was when I was around 11 too, and I made this awful lopsided heart-shaped pillow. It was the worst. What a pretty machine! I have a vintage one from the early 80s that I got as a Christmas gift last year. I was so excited to get it, but there's something wrong with the bobbin and I can't can't figure out how to thread it. Good luck with that Kindle sleeve!